More evidence has surfaced about how the rich rig and rort the system to get rich and richer. And how they buy politicians and parties. In 2016-17, 69 millionaires in Australia “arranged” their affairs and paid zero tax. Principally they claimed massive deductions for the cost of “managing their tax affairs”, and for gifts and donations. Many also claimed franking credits from their share portfolios, to avoid income tax or even to receive a payback from the government: 37 millionaires claimed $7.8 million in deductions. • $400 million for travel expenses. Meanwhile, big businesses donated massive sums to buy the parliamentary votes and policies of parties and politicians. For example, over a decade, the gambling, alcohol and tobacco industries donated $14.1 million to the parliamentary parties. These donations spiked at times when debate was occurring about alcopop taxes and gambling reform. Australia's pathetic laws only require disclosure of donations above $13,800. So, there are multiple secret donations of just under $13,800. The spotlight has recently been focused on the supposed influence of Chinese companies and individuals, but by far the biggest bribers are US and other multinational corporations and industry groups. Incidentally, Pauline Hanson and One Nation supported the meagre laws banning foreign donations to political parties, only to be caught with their hand in the till soliciting huge donations from the US National Rifle Association. Research in the US has tracked the relationship between donations to US parties and politicians, and their voting behaviour in Congress. There is a clear and consistent correlation. In the capitalist system, parties and politicians are for sale. Money doesn't just talk – it rules. On Wednesday 17 April well over 1,000 construction workers held a demonstration through the business and retail heart of Adelaide's Central Business District. The demonstration was part of the union movement's Change the Rules campaign. I am not a construction worker but being a member of another union for many years I thought it was a chance to show solidarity with construction workers and their union the CFMMEU as they had been targeted by big business and governments of both Liberal and Labor persuasions ever since I could remember. I was also interested to see how many construction workers would turn up, realizing that they had more to risk than other workers due to being subjected to not only the anti- worker Fair Work Act laws but also the special "construction police'' which I think are called the ABCC. When I arrived at the starting point of the demonstration in Adelaide's main square called Tarndanyangga/Victoria Square about 15 minutes before its scheduled start time, there were only a handful of construction workers with their flags and a couple of CFMMEU T-shirts there. I thought, "bloody hell, what's going on here!" In the next 15 minutes, the numbers had swelled to well over a thousand! Then a person who looked like one of the Organizers of the demonstration saw that I was wearing my union cap and carrying my union flag and came over and thanked me for coming along! I also saw him go round and speak to other people who were from other unions too! I thought that was pretty good of this Organizer and it made me think that all the stuff the media says about the CFMMEU construction union calling them thugs and other names was a load of rubbish! I got talking to a couple of the construction workers and asked where all the workers suddenly appeared from! They told me that these workers came from all the major sites in the city proper and that their union leaders had gone around and told the bosses that this was how it was going to be. Workers had a right to protest in what is meant to be the land of a fair go for all. Once all the construction workers had walked off their city jobs and arrived at Victoria Square, we all started marching down the main street, King William Street to the steps of Parliament House in North Terrace. On the way, the construction workers chanted, smiled and waved to the people on the footpaths who were out and about during their well-earned lunch breaks. There were also a lot of shoppers looking on as we got near the main retail area near the famous Beehive Corner. I have been to demonstrations on different issues. Sometimes the onlookers seem disinterested but on this occasion I could tell that a lot were paying quite bit of attention to the chants, the flags and banners. Again I thought to myself how wrong the corporate media were about the construction workers and the CFMMEU! The people on the footpaths were interested in what was going on here! The public reaction was the same when we got to Parliament House steps and the speeches started. Passers by were not booing or turning the other way. They were listening to the speakers and were curious! The speakers varied quite a bit in background. The CFMMEU first speaker was very clear in his message and did not beat around the bush. He said what workers in Australia were involved in now was a class struggle. On the one side was the minority ruling class of capitalist big business and the other side were the hard-working workers, not just construction workers, but workers of all different occupations. The CFMMEU national leaders who spoke told true stories about extreme workplace harassment of a young woman construction worker and the tragic loss of life of construction workers recently at their workplaces. 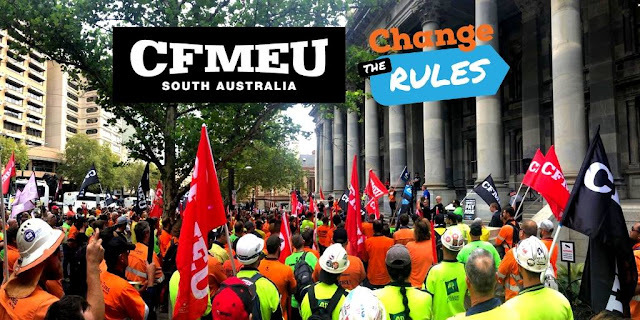 Even though it was a construction workers demonstration, the CFMMEU welcomed speakers from other unions and SA Unions to the microphone and they all expressed solidarity with the CFMMEU and construction workers and congratulated them all for having the courage to walk off the job to stand together in support of the Change The Rules campaign. After the demonstration and speeches finished, I thought what a great experience it was to be part of this. I reflected again on how the mass media of big business try to paint the construction workers as thugs and standover merchants! 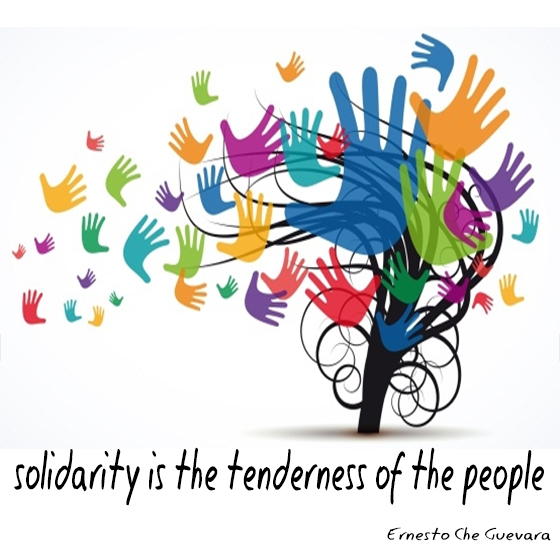 But what I saw in practice at this demonstration was the solidarity of these workers and a living example of solidarity being defined by I think people from Central or South America as "the tenderness of the people". I thought to myself that no matter what the outcome of the federal election, it is this solidarity of the workers that will win the hearts and minds of millions of working people. The wave of US-led militarism sweeping the Asia-Pacific region has, in many ways, focussed upon pushing more favourable diplomatic links with Taiwan. The US-led initiatives aim to tighten the net of containment and encirclement of China. • the manner in which US-led Taiwanese diplomacy has been conducted in countries such as the Solomon Islands has revealed high levels of interference with potentially serious implications for continued political stability, with potentially catastrophic implications. Diplomatic tensions have been rising between the US and China in recent times with the former providing increased support for Taiwan. Even before the presidential inauguration, members of the Trump administration were eagerly pushing Taiwan as a major player in US regional foreign policy against China. In recent times a number of issues have heightened diplomatic tensions. China regards the developments in a dim light with their One China policy; Taiwan has little diplomatic significance and is regarded as a rebel province. Most countries at United Nations level also diplomatically recognise China, meaning Taiwan has been pushed aside in recent years, with only seventeen allies; the Trump administration, however, appear intent on pushing Taiwan back into a major centre of 'US interests'. The US diplomatic initiatives, to date, have not been particularly successful. The so-called American Institute in Taiwan, while being pushed by Washington as an independent body, carries all the functions of an unofficial embassy in Taipei. The fact Moriarty was in Hawaii at the same time as President Tsai was hardly coincidental. The major diplomatic stand-off between the US and China over Taiwan is likely to be played-out on Australia's doorstep, in the South Pacific. While the elections in the Solomon Islands have already taken place, the final results have yet to be announced; a large number of independent candidates and coalition-building amongst those elected as M.P.s have resulted in a number of problems. The election of the Prime Minister, therefore, is not expected until Easter, at the very earliest. The Solomon Islands have long-held major defence and security planning for Australia: the Defence of Australia (DOA) doctrine rests upon the three Melanesian countries of the Solomons together with Papua New Guinea and Vanuatu, acting as a buffer to protect northern approaches in time of threat of military incursion. The stability of the three countries has been a major preoccupation with Canberra for nearly seventy years following the end of the Second World War, from the time of colonial control to independence and neo-colonial economic relations. In reality, dominant attitudes in Canberra have long-been questionable toward the three Melanesian countries. A long series of spurious aid programs have allowed Australian-based mining companies to plunder and pillage the land-masses for the benefit of shareholders the world over. Life, for the vast majority of people in the three countries, however, has remained based at subsistence levels with few realistic life-chances. I know why you're here. It is for the cash. For the Pacific, it is always about the cash. While Australian attitudes have long regarded the three Melanesian countries as a backwater, recent diplomatic initiatives from China have turned the DOA countries into a highly sensitive hotspot. The present questioning of diplomatic links between the Solomon Islands and Taiwan is likely to now raise political temperatures still higher. 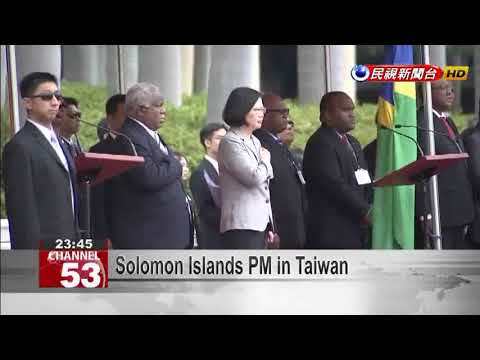 Behind the scenes, however, recent revelations about US-led Taiwanese diplomatic positions toward the Solomon Islands have shown widespread interference in the sovereign affairs of the country. A recent study conducted by Australian National University academic Dr. Denghua Zhang, concluded with the statement, 'it would be a mistake to under-estimate the extent of Taiwan's influence with the local political elite'. (12) Like many developing countries, the population of the Solomon Islands are based in multi-ethnicity; different ethnic groups have historically populated various islands. Institutions of state, including the legislature, are also weak and have possessed limited legitimacy in the eyes of many islanders; they fear the dominance of one ethnic group gaining the opportunity to exploit another through government systems. Political stability across the Solomon Islands, therefore, is at best, fragile and tense. Taiwanese diplomacy toward countries such as the Solomon Islands has also tended to be run along lines of provision of constituency development funds 'which are directly allocated to elected officials and are funded from Taipei'. (13) M.P.s. therefore, are given a payroll type of operation; influence clearly is brought to bear from outside for services rendered, which ultimately tend to be formally or informally linked to 'US interests'. The funding has been responsible for creating division and competition for patronage. Decision-makers in Canberra, particularly those involved with aid programs for the Solomon Islands, have been shown to be quite content to hide behind diplomatic silence while Taipei conducted pro-US policies and corruption with the DOA provision. The position has added weight to the observation decades ago, that 'the South Pacific is an area in which intelligence collection, political interference, and various dirty tricks can all too easily merge'. (15) Little has changed in a very long time. Whatever the outcome of the possible changed diplomatic position of Honiara toward Taiwan and China, the fact the pro-US policies and corruption is now being questioned in the Solomon Islands is perhaps a major shift in itself. The gravity of the present situation in the Solomon Islands was evidenced when Australian Defence Force personnel were posted 'to guard against possible outbreaks of violence' during the recent elections. (16) Their postings show just how important the Solomon Islands remain to DOA provision: fears of major hostilities between different ethnic groupings arising over gaining access to illicit funding from Taipei have serious implications for lasting political stability. Inter-ethnic problems and rivalries are not uncommon in the Solomon Islands. The present US-led Cold War is burning very hot at present in the South Pacific. We need an independent foreign policy to distance ourselves from this US-led charade! 1. US warns China over Taiwan sabre-rattling, Australian, 4 April 2019. 2. China hardens stance on Taiwan, Australian, 6 March 2019. 3. Australian, op.cit., 4 April 2019. 4. Fundamental Study of American Military Power, H. Fudzii, (Tokyo, 1986), page 214. 5. China warns US on stop-over for Taiwan leader, The Weekend Australian, 23-24 April 2019. 6. Australian, op.cit., 6 March 2019. 7. Australian, op.cit., 4 April 2019. 8. Pacific Island looking to China, Australian, 3 April 2019. 10. Pacific Ocean: environment disaster zone, The Guardian, 20 March 2019. 12. Australian, op.cit., 3 April 2019. 15. Oyster, The Story of the Australian Secret Intelligence Service, Brian Toohey and William Pinwill, (Victoria, 1989), page 262. 16. Australian, op.cit., 3 April 2019. 17. Confidential source, interview with senior ABC reporter. The Business Council of Australia (BCA) released a report on April 11 called “A Plan for A Stronger Australia”. The immediate question is “stronger for whom”? To answer that, we need to know for whom the BCA speaks. The BCA has 140 member corporations. They are the largest corporations operating in Australia and many of them are foreign-owned multinationals. They also include some of the wealthiest law firms, financial services corporations and transport and retail giants. ► reduce congestion in the cities. …and so the list goes on. Some of these companies have been on the list for the four years that it has been published. And the list of non-tax-paying companies doesn’t include those BCA members that use creative accounting to evade or minimize their tax obligations. Otherwise, how could Australian Unity Ltd pay only $915,000 tax on an income of $1.7bn? Nor does it include BCA members below the threshold used by the ATO for reporting corporate tax information: it does not bother with public and foreign-owned entities with a total income less than $100m, or Australian-owned resident private companies with an income less than $200m. In other words, there may well be more than 33 BCA member corporations that pay no tax at all. And pious utterances acknowledging Australian people’s difficulty in paying for home energy is hard to take from an organization whose members include giant energy companies that pay no tax whilst reaping in obscene profits from the pockets of Australia householders! The BCA has extraordinary influence. The capitalist mass media dutifully reports its policy proposals and runs articles and editorials based on its media releases in a way that is completely denied to unions and community organisations representing the people. It is precisely industry-wide agreements that are one of the aims of the Change the Rules campaign. There is some fluff in the Plan about strengthening TAFE and increasing the Newstart Allowance and a token nod in the direction of “initiatives to build economic opportunities in Indigenous communities.” We know, thanks to Lindy Nolan, what that last one means (Lindy Nolan, “Driving Disunity: The Business Council of Australia Against Aboriginal Community”, Spirit of Eureka, 2017). Against the BCA, we the people have our own demands, our own plan. 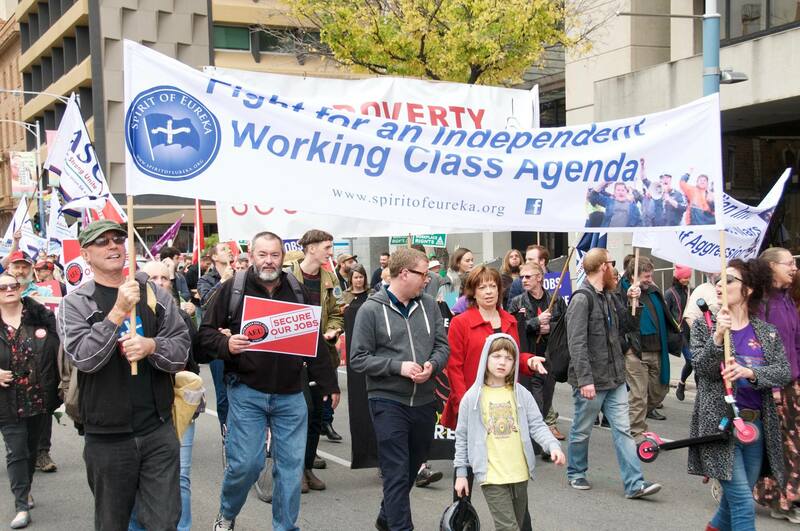 We have our own independent agenda with demands for democratic and workplace rights that the BCA will never support. They include seizing the assets of foreign capital in Australia and socializing their operations. They go beyond Changing the Rules, which we support, to changing the system, for which we plan. The US and China, the two biggest economic powers when it comes to world trade, are on the verge of a new trade deal. The US has a US$400 billion trade deficit with China and Trump is desperate to increase US exports to China before the next Presidential election. Problem is that any increase in purchase of US goods by China will come at another country's expense, including Australia. An example of Australia's vulnerability is the export of Liquefied Natural Gas (LNG). The US is pressing China to buy more LNG from the US. Will this be at Australia's expense? There is a scramble from LNG producing countries to win a good share of the Chinese expanding demand for LNG. In January 2019, China announced that it intends using 34 coastal terminals to import 247 million tonnes of LNG by 2035. World trade in LNG in 2017 was only 289 million tonnes. The US want the lion's share of that LNG increase in demand by China. If they get their way it is likely to see a drop in exports of LNG from Australia to China if the experience of coking coal exports is any indication. In February 2019 exports from Australia to China of coking coal fell 21% per year while China’s imports of coking coal from Mongolia rose by 47%. This wiped billions of dollars off Australian generated mining stocks, not to mention in reduced jobs. 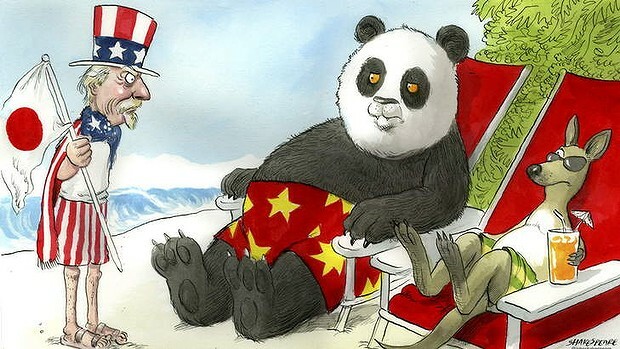 Following the US and Canadian lead by banning Huawei added to the mess the Australian Government finds itself in when it comes to relations with both China and the US. "Free Trade" deals that Australia signs up to with the big imperial powers mean nothing when it comes to those big powers doing deals between themselves which disadvantage smaller countries including Australia. As the two main political parties talk up their "economic credentials" for running the country in the lead up to the 18 May election, the reality is that there are storm clouds gathering due to increased trade tensions and deals between the big powers China and the US which will have unpredictable impacts on Australia's development and the people's living standards. Take the wine industry as another example. The wine industry is a key exporter and a big employer in many parts of Australia. An important and growing export market has developed to both China and the US, not just to Europe. Currently US wine exports to China incur a tariff of about 40%. From 1 January 2019, Australian wine exports to China were tariff free. This trade advantage over the US regarding wine exports to China is highly likely to evaporate at short notice under pressure on China from the US to drop the 40% tariff. 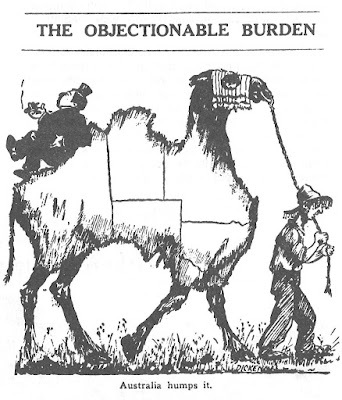 As long as Australia has an unbalanced economy dependent on dictates and demands of the big powers rather than an economy based primarily on self-sufficiency and trade as a secondary aspect, there will be no stability and economic security for the working people of Australia. Only an independent Australia led by the working class can navigate an economic course for a sustainable future.